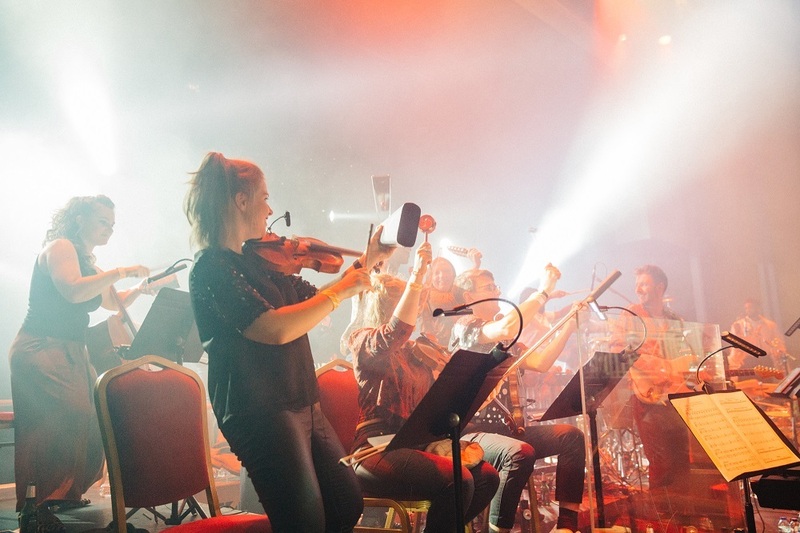 The 20-piece Outlook Orchestra was founded when Outlook Festival wanted to celebrate their 10th year with a unique music project. 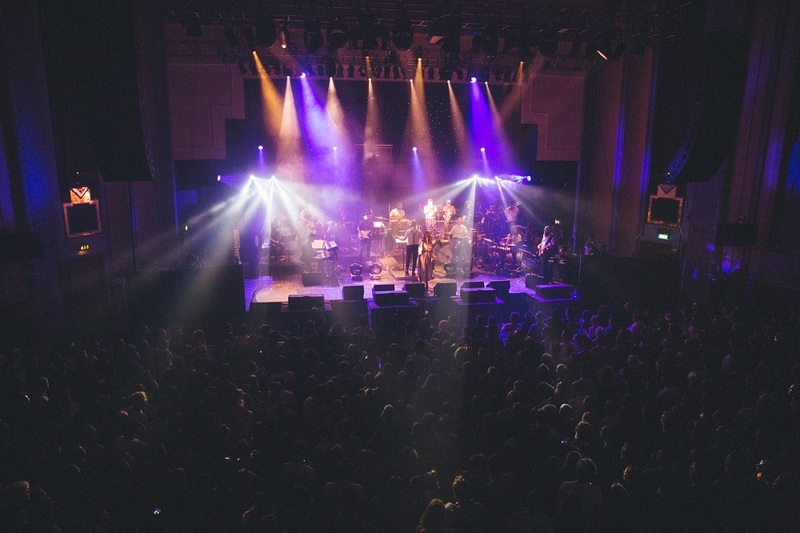 They collaborated with Southbank Centre by bringing together some of the UK’s finest musicians, including two drummers in an extended rhythm section plus string and horn sections, to create a 100-minute live mix celebrating classic bass-heavy tracks that have been played on soundsystems worldwide. 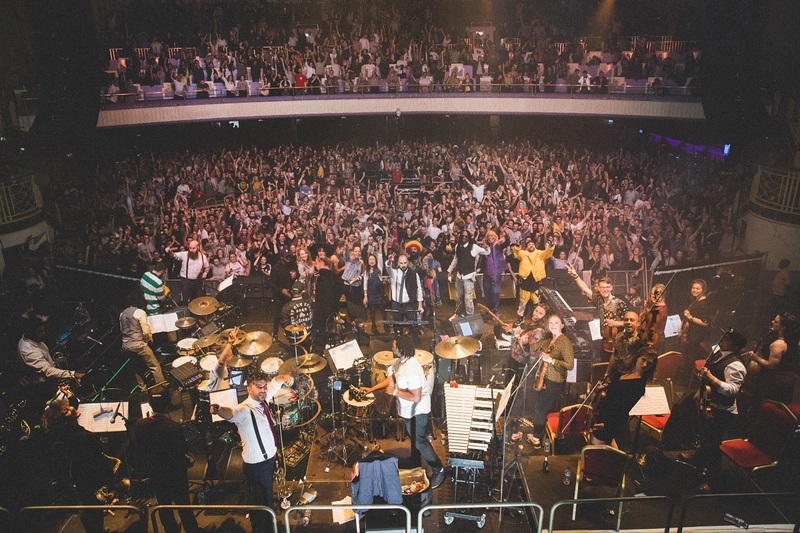 Laura Jones was at the final performance of the original line-up at The Troxy on Thursday, October 26th before David Rodigan MBE takes control in March next year. The 100 minutes flew by in a hazy blur of flashing lights and live bass wobbles. Outside, it was a regular Thursday night on the streets of Shadwell, but once inside gorgeous Art Deco venue The Troxy, the mood was very much one of a Friday. The crowd’s readiness to skank to the solid line up of reggae, dubstep, jungle, drum’n’bass, grime, hip-hop brought together under Outlook Festival’s mission statement to celebrate bass culture, was palpable by the excited chatter above the DJ. Whether they had been to Outlook in Croatia, or had seen the orchestra on its inaugural outing earlier this year, I couldn’t know. Being a newbie to both, I was just happy to be here to see the names that were a big part of my formative London years, including drum’n’bass songstress Jenna G, and UK hip-hop artists Foreign Beggars. 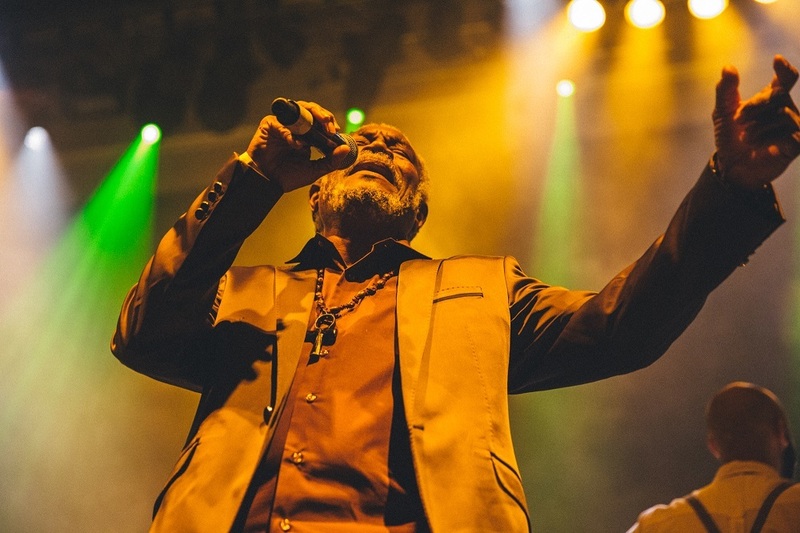 But first up, as the string section arranged themselves, and the trumpets cried, was reggae legend Horace Andy. Looking sharp in a suit, he opened with his 1972 hit Skylarking. By his last song, a cover of “Ain’t No Sunshine” he had the crowd singing along and nicely warmed as if they were on the beaches at Pula itself. We were well on our way and into the one hundred minute live mix, expertly conducted by Tommy Evans. Foreign Beggars got the crowd pumped, with Orifice Vulgatron’s flows as tight as ever on 2003’s dark and brooding “Home”, made all the more sinister by the Psycho-esque plucked strings. There is a current trend for taking the music that was born in the clubs out and blinking onto the live stage with varying degrees of success, as if the scene can’t argue its cultural importance without protesting “Look! It’s being played on a live bass and drums and has a violin so it must be good music!” Leaving my scepticism at the door, I can honestly say that this event was more than the sum of the artists’ and musicians’ parts, and was a richer experience for it. A smooth interlude and a refuel at the bar, then it was back down into the pit for the wonderful Jenna G who belted out a superb version of MJ Cole’s “Sincere”. 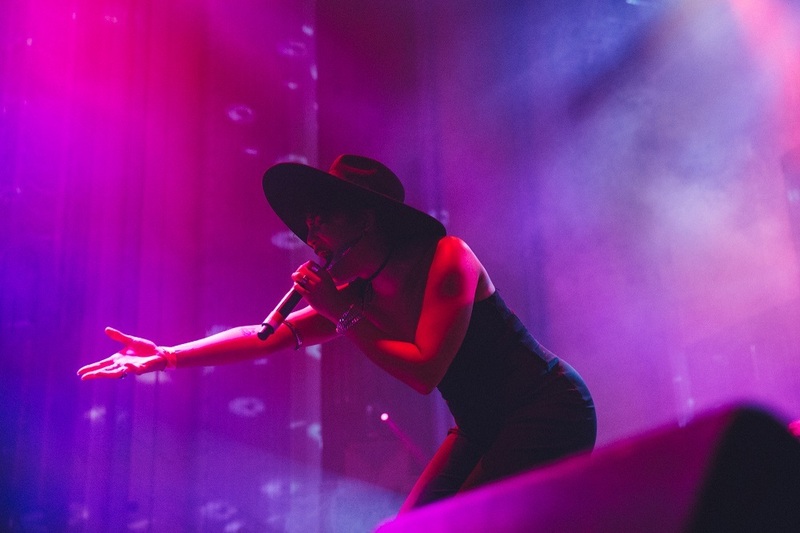 Performances from grime artists Flowdan and Killa P, jungle pioneer Congo Natty featuring Nanci and Phoebe, rapper Jehst, jazz singer Ruby Wood, and energetic MC Jila flowed seamlessly, a credit to the skilful arrangement of the score. And I never thought I’d write in my notes “great orchestrated cover of Burial’s “Archangel” but I was blown away. The great atmosphere never wavered, and the tunes kept rolling, luckily for me of the veteren junglist kind. General Levy stormed through Incredible, and Roni Size’s Brown Paper Bag never sounded so good with live musicians at the helm. The drums (two kits!) and the bass had their workouts, but it was the horns that sounded sublime when Jenna G was back to sing her 2006 hit “In Love”. By the time we reached the pinnacle with Dawn Penn and her greatly anticipated hit “You Don’t Love Me (No, No, No)” those one hundred minutes had flown by in a hazy blur of flashing lights and live bass wobbles, leaving the crowd desperate for more. But we would have to stay content with the famous refrains of all those popular tracks ringing in our ears, until the Outlook Orchestra is back with a new score for 2018. 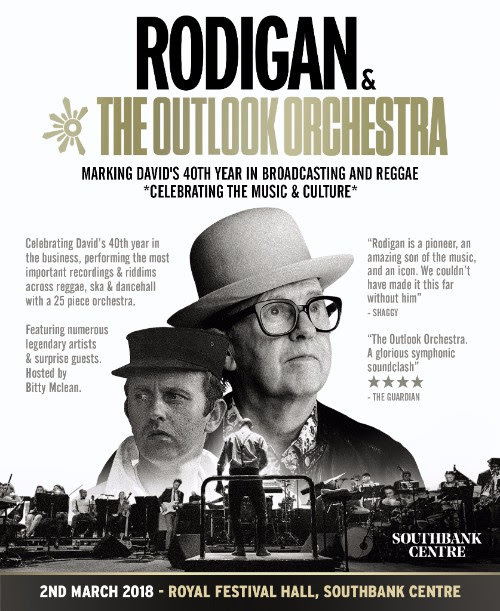 Iconic selector, broadcaster and curator David Rodigan will team up with the Outlook Orchestra to perform riddims and classic recordings from David’s 40 years in the business on Friday, March 2nd at Royal Festival Hall. Hosted by Bitty McLean, there will be surprise guests throughout the show. Sign up for pre-sale tickets at RodiganLondon.com; general sale tickets on sale Friday, November 10th.